Described as a CEO, entrepreneur, risk taker, outspoken leader, executive consultant, author and keynote speaker, Dave Gilbert is best known for gathering a team of young, inspired communication professionals and founding SimpleSignal in 2003. The team's dedication to it's unique culture, relentless innovation and focused execution took SimpleSignal's UCaaS technology to all 50 states and served tens of thousands of satisfied business customers with 99.99% uptime. In April of 2015, SimpleSignal was acquired by Vonage. Under Gilbert’s leadership SimpleSignal won many awards. Among them the Frost and Sullivan North American Entrepreneurial Company of the Year and was named by Inc. Magazine as one of the 5000 fastest growing companies in America for four consecutive years (2011,’12,’13 and ’14). Dave resides in the sleepy little beach town of San Clemente, California where he keeps his collection of cool hats. A seasoned sales and marketing leader with 27 years’ experience in technology, Mike Cromwell has vast experience leading sales organizations ranging from over $1B in annual revenue to start ups across multiple customer segments and distribution channels. He is currently the Founder & CEO of EagleTEQ, which specializes in sales and marketing advisory solutions for emerging technology companies. Cromwell is also the CEO & co-founder of Loup, a Google powered SaaS integration platform launched in 2017. He is a UCaaS thought leader, a frequent speaker on industry panels, forums and participant on advisory councils. Previously, Cromwell was the Chief Sales & Marketing Officer for ANPI, which was acquired by Onvoy in 2016. He led the efforts to launch ANPI’s UCaaS business, played a key role in architecting an industry leading Private Label platform and was recognized by both BroadSoft and Polycom as one of the fastest growing and top producing providers in North America. Prior to ANPI, Cromwell was the SVP of Sales & Marketing for XO Communications where he was responsible for XO’s enterprise sales efforts nationally, leading a sales force in excess of 500 people and $1B in annual revenue. Tom Schollmeyer is a contact center industry veteran with more than 20 years of experience in developing and leading contact center technology companies. Offering a unique combination of global technology, operational and sales expertise, he has a passion for envisioning, articulating and driving new and innovating products. Schollmeyer has served as CEO of Serenova, Vice President and General Manager of Customer Engagement, UC Applications and Cloud with Avaya and CTO for Five9. As Vice President of Corporate Development at Ooma, Chris Burgy is responsible for M&A, strategic partnerships and enterprise strategy. Prior to joining Ooma, Burgy was Vice President, Corporate Strategy at ShoreTel where he was responsible for the overall corporate strategy, M&A and strategic partnerships. He was instrumental in the transformation of ShoreTel into a cloud company and in leading the key acquisitions and ultimate sale of ShoreTel to Mitel. Burgy holds an M.B.A. and B.S. Business Administration from California State University, Bakersfield. In his spare time, he enjoys spending time with his family and plays competitive tennis in the USTA. As a former partner of a leading law firm in Washington, DC, Joe Bowser has spent the majority of his career litigating complex telecommunication, privacy, consumer protection and intellectual-property-related matters. He has handled lawsuits from coast to coast, in state and federal court on an individual and class basis, and also advocated before state and federal regulators.Joe has guided tech startups and marketers through the regulatory minefields, helping those clients detect and sidestep any proverbial mines along the way. With his deep background in telecommunications and the Telephone Consumer Protection Act (TCPA), Joe is eager to assist clients in navigating the shifts in the FCC’s TCPA policy—and the courts’ efforts to keep up with those shifts. Joe is a co-founder of Innovista Law and the TCPA Defense Force, and ready to talk TCPA defense strategy, Premier League soccer, literature, technology, or his wild and wonderful two boys. Lynsey Haynes is a software engineer at Slack, where she works on the media server that hosts Slack's voice, video and screen sharing calls. Haynes was previously a developer on the WebRTC project and has a love for mangosteens and network protocols. William Liu is Yealink’s Sales Director of North America, focusing on providing services and support solutions for service providers. Liu has had many successful experiences providing support suggestions and proposals to ITSPs, which has helped them double their VoIP business. Ryan Krakower is a co-founder and the acting CEO of R Squared Telecom. Ryan previously owned and operated a network of call centers in the US and Asia-Pacific for outsourced BPO technology companies. Today he propels R Squared forward, leading projects utilizing new technologies, recently focusing on machine learning. We are beyond excited to host each and every one of our speakers and are looking forward to an unforgettable and valuable event. 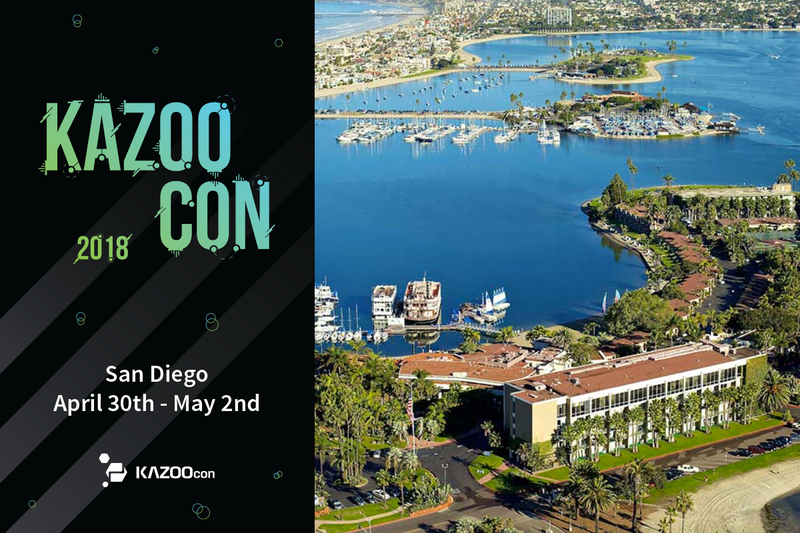 To learn more about KAZOOcon, please visit kazoocon.com - there’s still a couple days left to get your tickets!